The brilliant and multi-talented Tony Duquette was a creative force whose designs extended from from painting and sculpture to stage sets and interiors to costumes and jewelry. 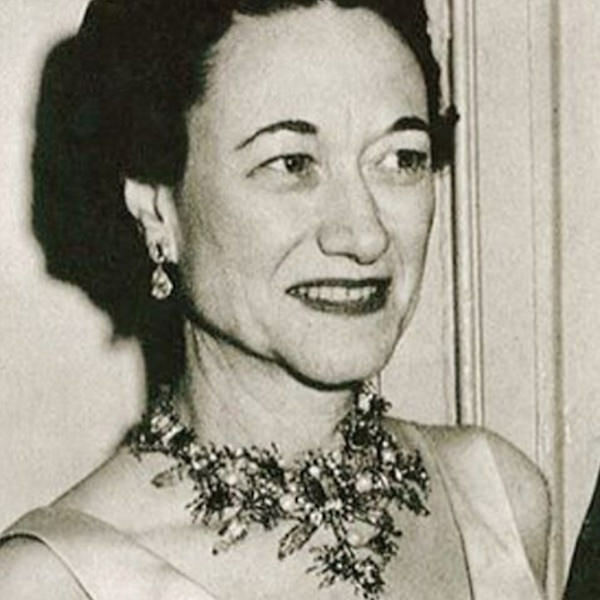 After creating the famous “Floral Wreath” necklace, below, commissioned by the Duke of Windsor for his wife in the early 1950’s, Duquette went on to complete jewelry commissions for special clients through his career until his death in 1999.
lighting, decorative home products and of course jewelry. 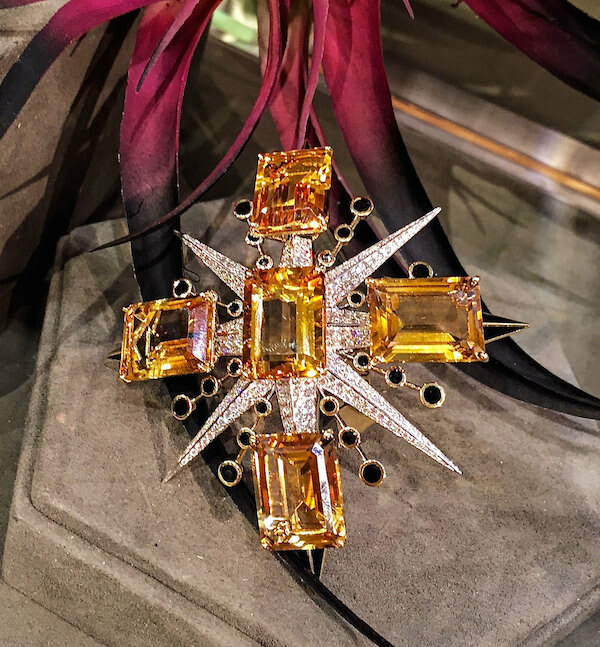 A couple months ago, Hutton found a new home for Tony Duquette Jewelry at the Kentshire boutique on Bergdorf‘s chic 7th floor. 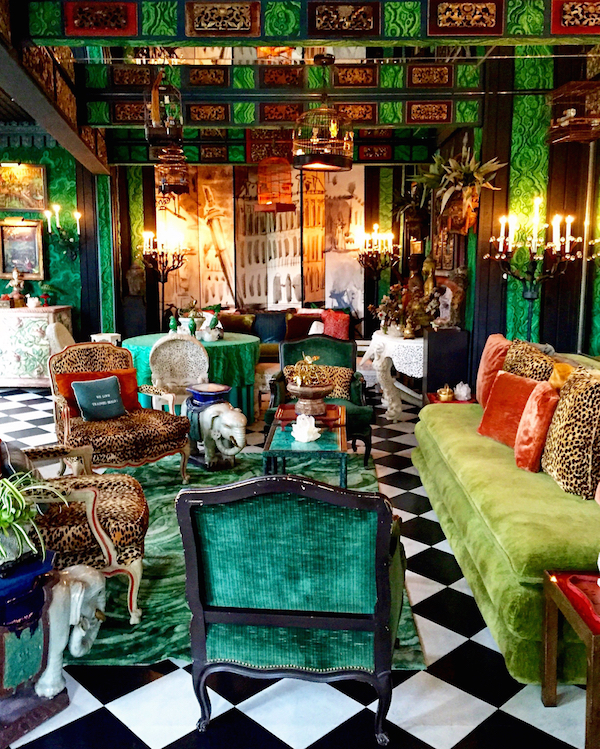 Brother and sister team Carrie and Matthew Imberman, third generation owners of Kentshire, recently divested the firm of their antiques and furniture collection to focus on their outstanding jewelry offerings, where Hutton’s unique one of a kind pieces fit perfectly. An inaugural event included a lovely breakfast in BGs followed by a visit to the Salon with the designer. 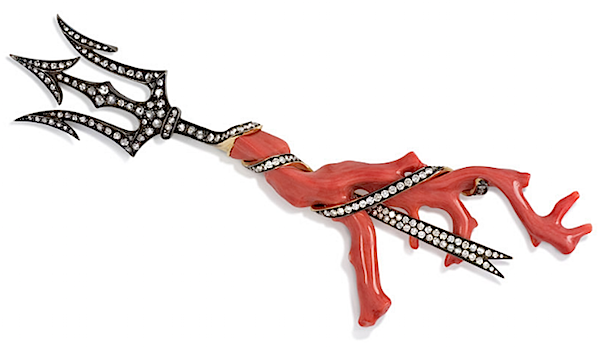 Tony Duquette Jewelry is not for those seeking dainty understated jewels. 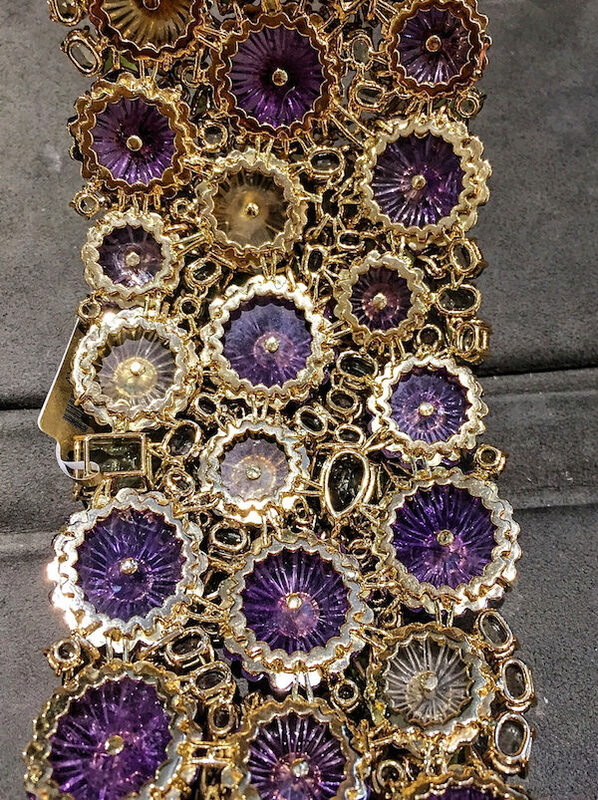 These are bold, spectacular statement pieces, rich in color, detailing and extravagant workmanship. It was a thrill to take several of these works of art for a ride. 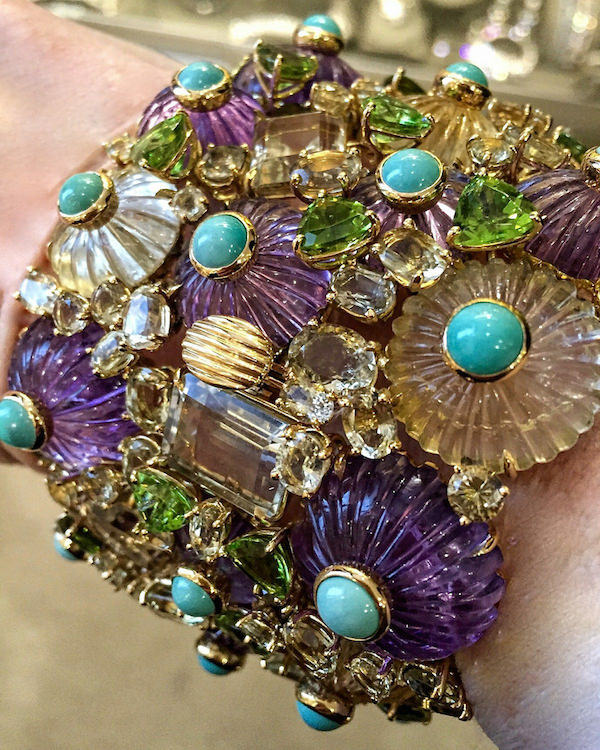 Above, an 18k bracelet of large amethyst, citrine, peridot, and turquoise with carved amethyst and citrine florets, each centered by a turquoise, and embellished throughout with triangular peridots and citrines of various cuts. As Hutton explains, “We have no snobbery of materials at Duquette and treat the lowest moonstone to the same extravagant workmanship in gold that other jewelers might lavish on a precious diamond.” The intricate back of the bracelet, below, illustrates the point. Inspiration often comes from nature, fueled by Hutton’s lavish imagination. 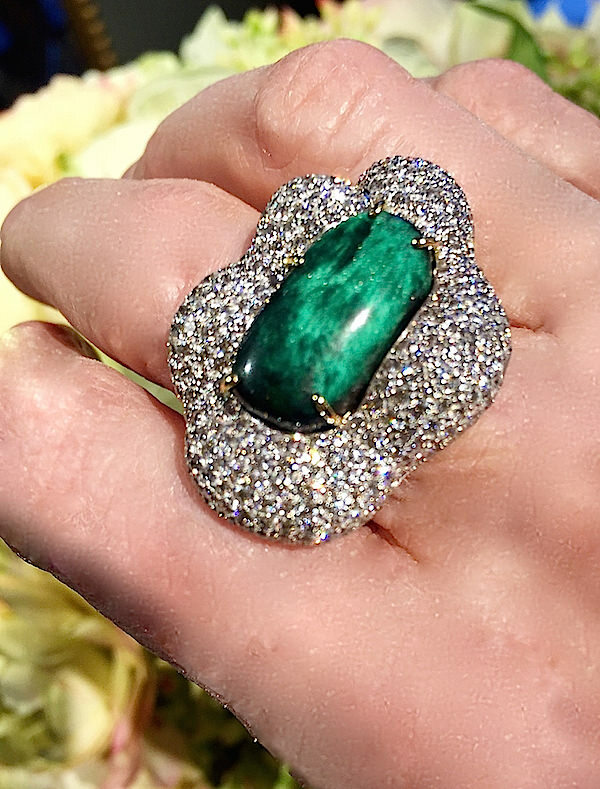 Coral, like malachite, is inextricably associated with Tony Duquette and Hutton has long been bitten by the bug. 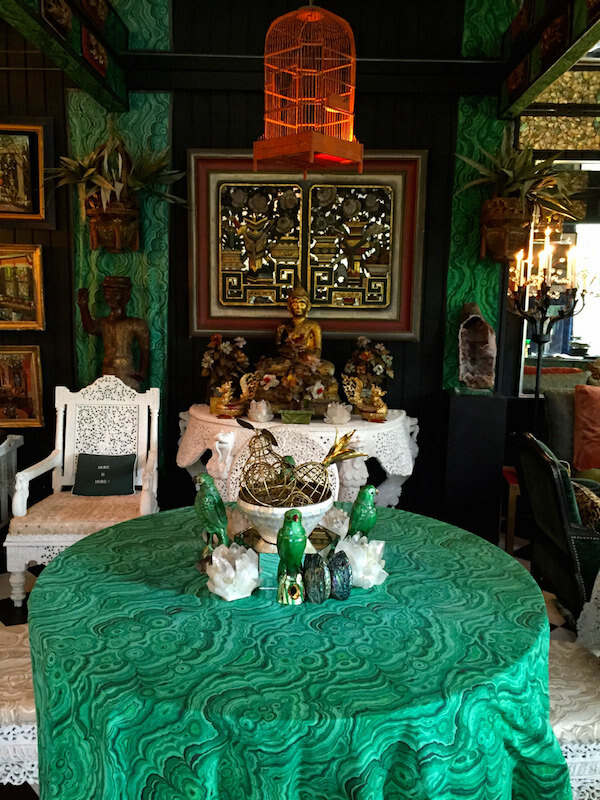 In his home (see our video visit here) and throughout his licensed collections and interior work, Hutton is just “gaga for coral.” Both Tony and Hutton believe in the protective and healing power of stones and coral has a long history. Legend has it that coral grew from the severed head of Medusa (the Gorgon), cast into the seaweed by Perseus, hence its original name gorgonia. Both the Gauls and Chinese applied coral to their shields and armor as a protective measure and many cultures consider it to be a mystical gem with good luck. 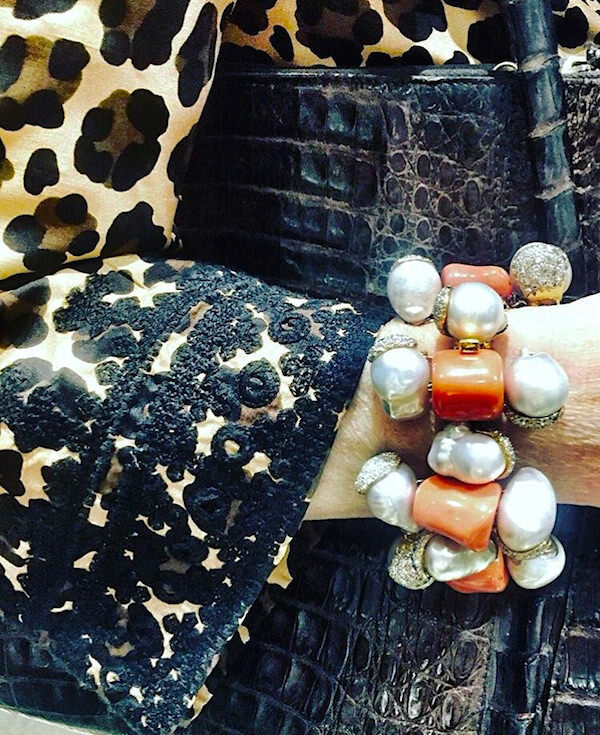 I’m quite sure that if I had left wearing this extraordinary baroque pearl, coral and diamond bracelet, good luck would have flown my way. It so clearly was meant to be part of my signature look! 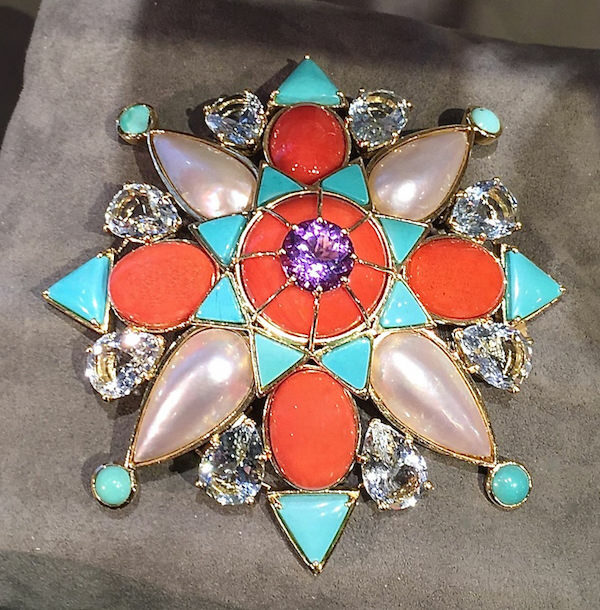 Coral and pearl are partnered with turquoise and aquamarines, topped by an amethyst in the symmetry of the brooch below. Another daring version of similar coloration. 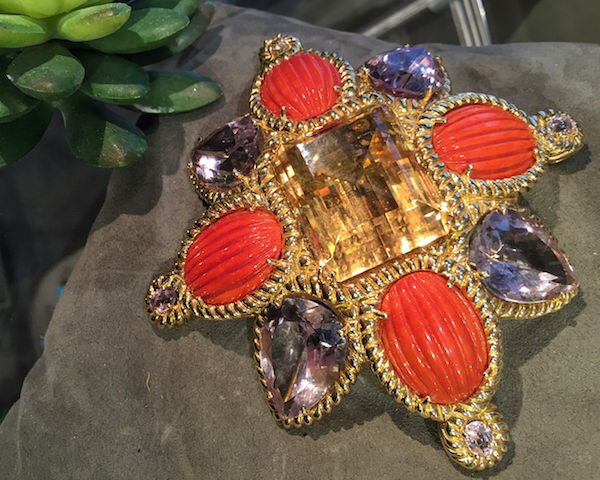 And below, the coral is carved for a more formal look, surrounding a rectangular 146 carat citrine with alternating pear-shaped amethyst, all outlined by an 18k gold twisted rope. 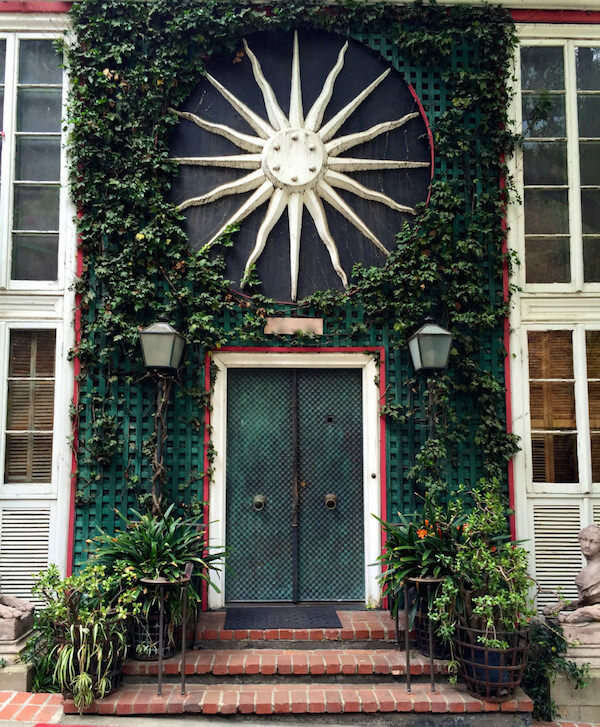 There are many themes that cross design divides throughout Duquette’s work, including the sunburst, seen over the entry of his Los Angeles home, Dawnridge, below. and gold and fancy cut citrine and smoky quartz brooch with diamond accents. 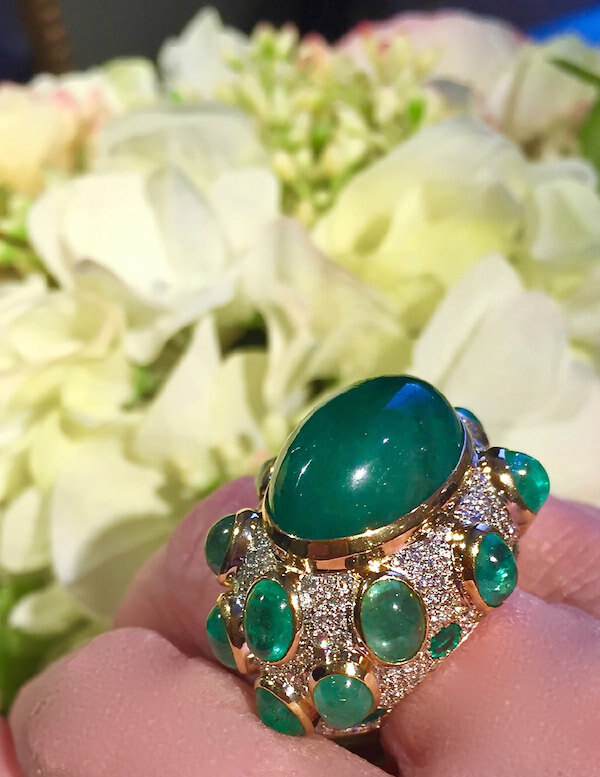 or the insanely fabulous organic shaped pavé surrounding the emerald in the ring below. 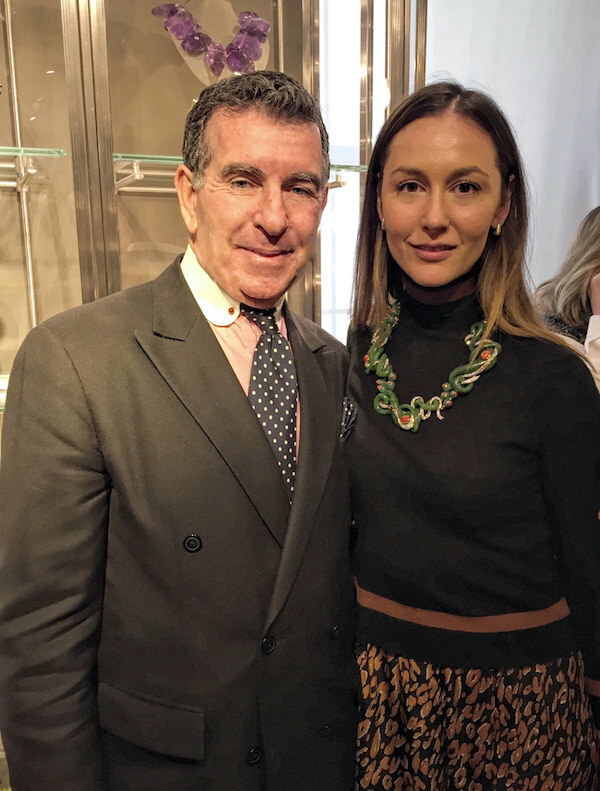 And friend Ashlee Harrison, Director for America of Carpenters Workshop Gallery, looked simply stunning, next to the dapper Hutton, in the sinuous new nephrite Jade, coral and diamond necklace. 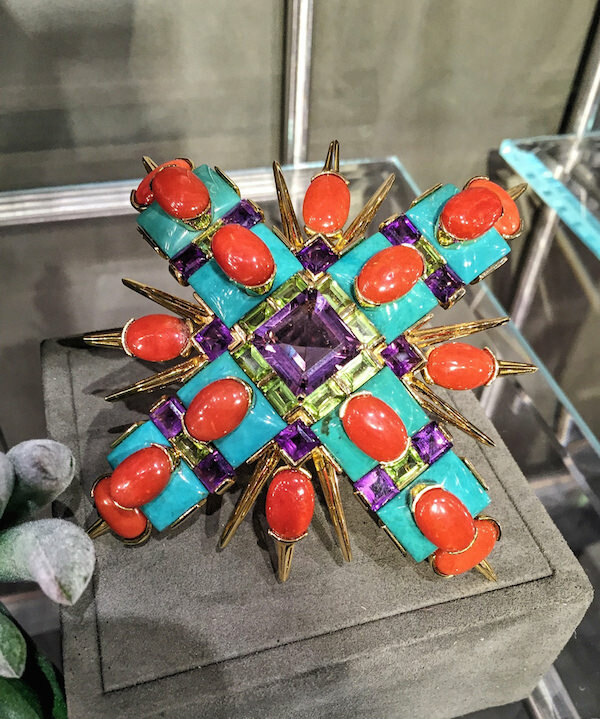 Inspired by nature and a creative assemblage of stones and design, Hutton’s one of a kind pieces for Tony Duquette are mini masterpieces. 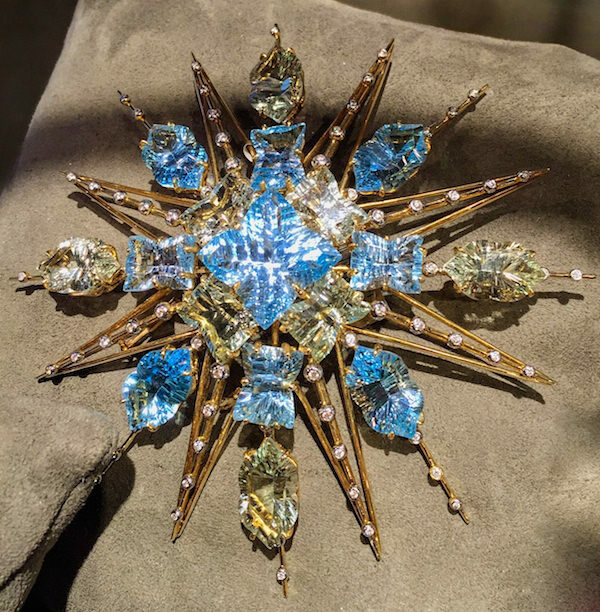 As Hutton explains, “The Tony Duquette collector not only appreciates these pieces as works of art but also for the sheer pleasure they bring regardless of whether they are comprised of pebbles and shells found washed up on the beach or diamonds and rubies.” See you at Kentshire! This entry posted in design, fashion, jewelry. 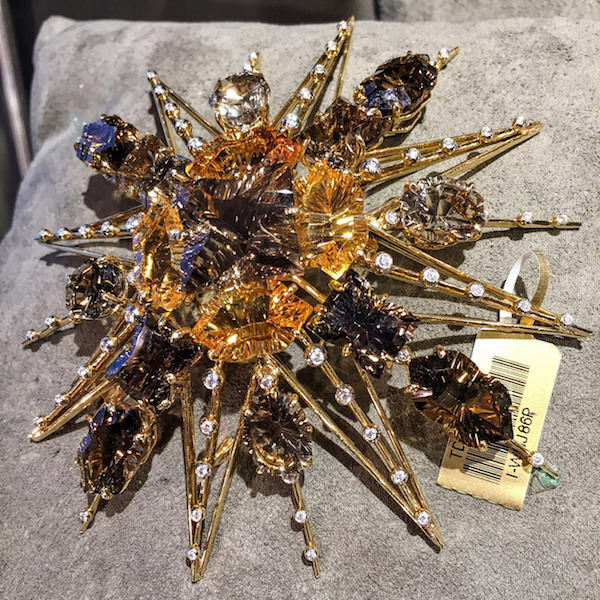 Entry Tags: Bergdorf Goodman, fine jewelry, Hutton Wilkinson, Jewelry, Kentshire, Kentshire Gallery, Tony Duquette Bookmark the permalink. It is fabulous! Great selection! Stunning details lovely color combinations and elegant jewelery. He does such fabulous work! His wife always arrives wearing the most unbelievable broach on her coat or jacket. Can’t take my eyesight off each of them. Such a talent! 81 queries in 0.580 seconds.